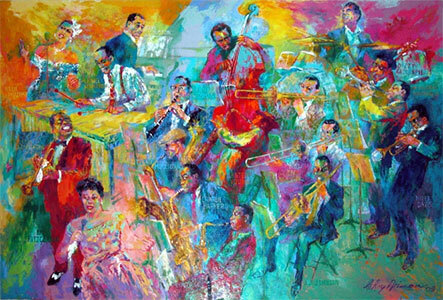 Big Band by LeRoy Neiman, 2004. Courtesy LeRoy Neiman Foundation. “Big Band” is by American painter LeRoy Neiman, who was known for his brilliantly colored, expressionist paintings and screen prints of athletes, musicians and sporting events. Completed in 2005, this work depicts performers he saw in concert from the 1950-80s. It is 9x13 feet and features a composition of 18 iconic jazz musicians, together in what he envisioned to be his “dream” band.